A freeware to protect the sensitive files, prevent your protected files being read,written,deleted, renamed, copied out of the protected folder, allow you to authorize or deny the file access to specific user or process, also allow you to hide the files or automatically encrypt/decrypt the files on the fly. With military grade AES-256 bit encryption, to store and share files inside and outside your organization or in the cloud easily and without leaking your sensitive data, the shared file can stay protected wherever it is copied, moved, or sent. you can track the shared files to know who accessed the file, from where and when were accessed, to know the access status which was authorized or denied and why was denied. 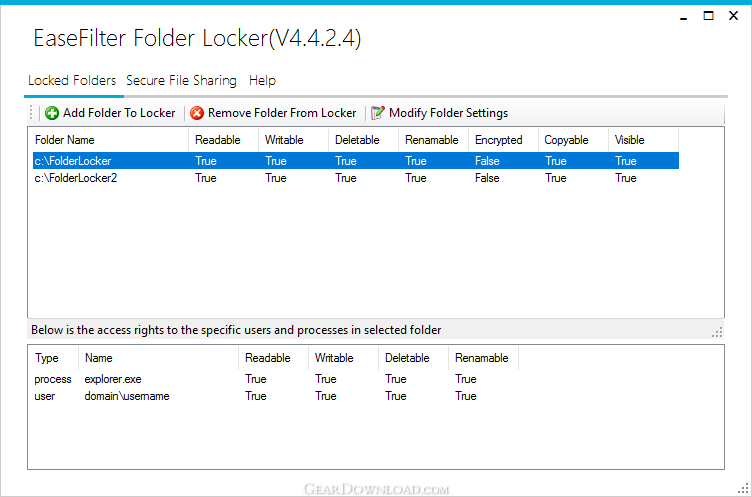 This download (folderlockersetup.exe) was tested thoroughly and was found 100% clean. Click "Report Spyware" link on the top if you found this software contains any form of malware, including but not limited to: spyware, viruses, trojans and backdoors. AssureFiles Secure File Sharing 4.3.6.1 - Secure File Sharing With Digital Rights Management,Safeguard file sharing. EaseFilter Auto File Encryption 4.1.2.2 - The Auto FileCrypt tool provides comprehensive encryption solution.